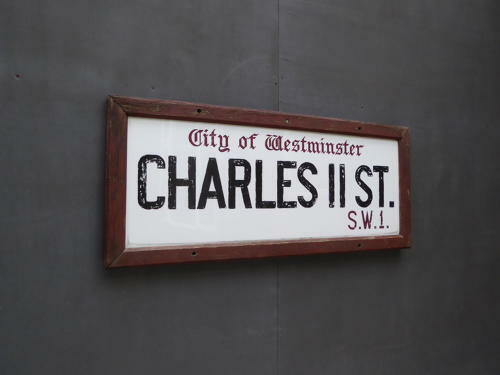 A beautiful antique milk glass London Street sign for Charles II Street SW1. A wonderful, early piece of London history from the heart of the city, in thick milk glass with deeply etched lettering in a contrasting original black & red paintwork which is complemented by its original oak frame. Built in 1665, Charles II Street lies in St Jamses' in Wesminster, crossing Regent Street & adjoining with Pall Mall. Wear commensurate with age, very good overall, glass perfect, one corner of the frame is showing it's age a little but all very solid & ready to hang. Collection in person preferred though a UK courier service may be possible, please enquire for details.